Ben Lamb was blessed by the poker gods in 2011 with a healthy dose of “Run-Good” which when given to a player who is already amongst the best in the world creates a deadly combination. 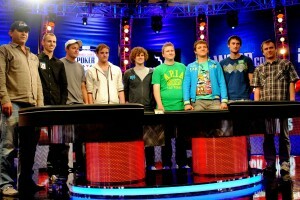 The question remaining is whether or not Lamb’s “Run-Good” will last through the 2011 WSOP Final Table. Now, nobody is arguing that Lamb needs to run good in order to win the WSOP –he definitely has the skills to be the Main Event Champion—but as we have seen over the years, the WSOP championship can often come down to the single turn of a card, and you better be on the right end of that card! If Ben Lamb wins the WSOP Main Event it will be a boon for poker, as Lamb has an excellent personality, is well spoken, and would make a great ambassador for the game. It would also be the first time since Carlos Mortensen back in 2001 that a well-known poker pro captured the WSOP title. Phil Collins and Matt Gianetti are also top level poker players but they simply lack the reputation that Lamb possesses. Lamb will begin the final table in the upper half of the chip counts, which puts him in a far different position than other recent top level November Niners like Phil Ivey and Mike Mizrachi –both of whom needed to chip up to have a shot at the WSOP title. While Mizrachi managed to take over the chip-lead for a spell at last year’s WSOP Main Event final table, Ivey simply couldn’t get anything going in 2009, but in the end both players fizzled out and were unable to finish better than 5th. This entry was posted on Tuesday, November 1st, 2011 at 7:39 pm and is filed under Poker News. You can follow any responses to this entry through the RSS 2.0 feed. You can leave a response, or trackback from your own site.